Following a look at the “Knicks” colorway, the Swoosh will also be releasing this Nike Air More Uptempo White Black colorway as part of their Spring 2017 lineup. 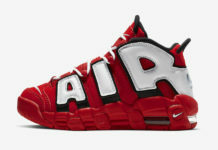 Look for the Nike Air More Uptempo “Scottie Pippen” PE to release on June 29th at select Nike Sportswear retailers and Nike.com. The retail price tag is set at $160 USD.